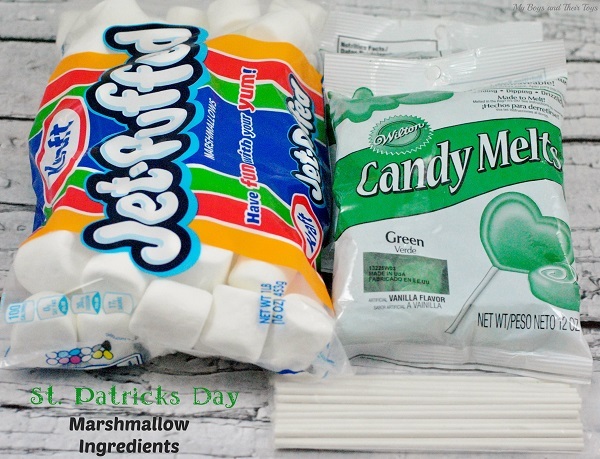 How cute are these St. Patrick’s Day Marshmallows? They are super simple to create, and easy enough for the kids to pitch in! Step 1: Place all of the green candy melts into a deep bowl and microwave for one minute and then stir. Place them back in at 30 second intervals until they are melted completely. Step 2: Place a candy stick into a marshmallow, be careful not to push it all the way through. Step 3: Hold your marshmallow over the green candy melts and spoon the candy on to cover the whole marshmallow. Gently tap the candy stick on the side of the bowl to knock off any excess candy. Step 4: Put the marshmallow pops into a Styrofoam block or cube until dry. Step 5: When they are completely dry, melt 1/2 bag of white candy melts. Next, hold the marshmallow pops over the bowl of white candy melts and drizzle some on. It is easiest to get a spoonful and begin drizzling it down. When it is almost done, quickly whip the spoon back and forth above the pop to get a think splattered drizzle look. Step 6: Place the marshmallow pops back into the Styrofoam block to dry. They are ready to eat and enjoy! These would be fabulous treat for your child’s classroom, St. Patty’s Day potluck, or dessert for the family. This is a great idea! I know my daughter would love to make them. Plus I like how easy it is to make them. Thanks for the recipe! of course! Hope your daughter enjoys. 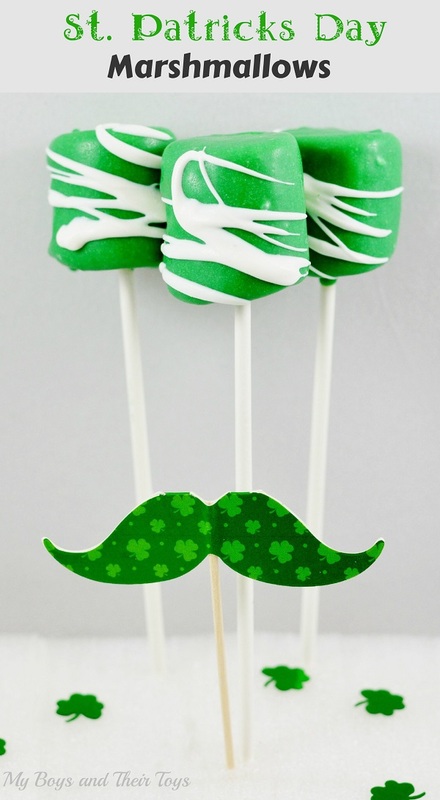 What a great idea for the kids to take to school as a St. Patrick’s day treat! This looks like an easy recipe and I am sure the kids would love these for St. Patty’s Day. oh WOW! Super cute for St. Patty’s day! My youngest is going to have a ton of fun making those! It’s something the older kids can help the younger ones with. These are so cute! And what a good idea to use marshmallows, would be so much easier that cake pops! omg marshmallow and choc my fave combo! this is a great idea and quick thing to make too! love it! So festive! I love it! I like how simple it is to make. My grandsons would love to eat these. Very cute. I pinned these and will definitely make them next year. I recently made my first dipped marshmallow for a baby shower and they were adorable. Love this idea. So cute! Sharing….